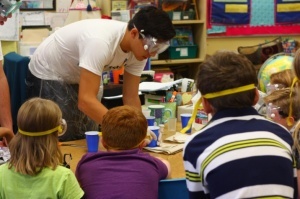 In Fall 2014, Tanque Verde High School ChemClub members had an opportunity to work with 3rd grade students in our school district presenting activities about polymers provided by the American Chemical Society. We were assigned to a specific 3rd grade teacher at two elementary schools in Tucson, Ariz. (Aqua Caliente Elementary School and Tanque Verde Elementary School). 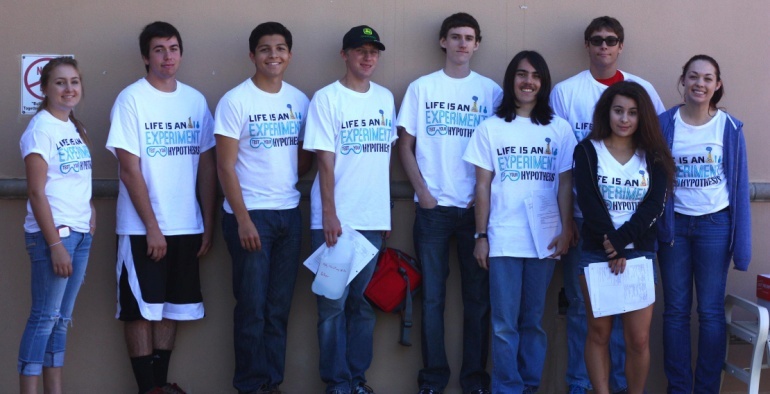 For some of our veteran ChemClub members it was a second chance to work with elementary school kids. It took us two weeks to build kits for the students to use during the outreach, as well as to practice our presentation. Most of the ideas were from the “Jiggle Gels” guide, but we included an activity to illustrate cross-linking and expanded the demo to show the making of artificial snow. Everyone was expecting us at the elementary schools. Kids were very excited seeing us with the boxes full of materials and could not wait for us to start. In all of the excitement, lots of water got spilled on the tables. Luckily we were prepared and brought additional supplies with us! Kids were completely stunned by the first demonstration where the water poured into a series of cups seemed to disappear when the cups were inverted. The students were even more interested in this demo when we showed them how properties of sodium polyacrylate polymer made this possible. It was a very good opening to the outreach presentation because this demo caught the students’ attention and made them want to experiment with that substance. They really liked working with pipets and studying the properties of the sodium polyacrylate polymer. For our next demo, we made artificial snow. That was a big hit! Everyone was fascinated with it, many saying things like “Wow! It even feels cold and wet like snow” and one student even tried to make off with a handful of the snow before we caught him. Distributing the Gro-Dinosaurs for a graphing activity was a good break for the kids because they could remove their goggles for a while. But no one complained when we told them to put the goggles back on. They were so excited to make slime! For the Super Slime activity most of students handled the pipet and borax solutions very well and had no trouble deciding quickly who would stir and who would add the solution. They loved the slime they had created and we could barely get some of them to divide it and store it in plastic bags so they could take it home later. 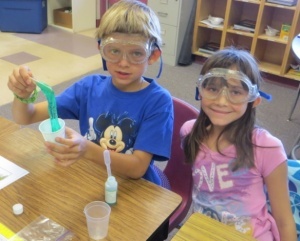 To help 3rd graders to understand how slime is made, we had a cross-linking activity. We had volunteers to wear green tags with “X-link” written on them. All other students made chains by holding hands, and the kids with the cross-link tags were grabbing to the chains. During the final demo we compared two plastic bags made of different polymers. Kids couldn’t believe that the PVA plastic was dissolving in water. Then we put water into a regular plastic bag to show them that it had different properties. We did this by poking sharp pencils into the bag, but this plastic is so elastic the holes made by the pencils didn’t leak. I had to refrain from laughing when almost every single kid flinched as the presenter stabbed the first pencil through the water filled bag. To be completely honest, I was actually silently praying that the bag wouldn’t rip and spill all over the floor. By the looks of him, the student presenting this was thinking the same thing. Our students reacted enthusiastically to every part of our presentation, and their comments were the best part of the day. 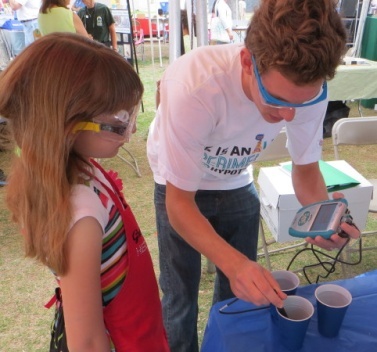 We kept the students engaged with jokes and hands-on demonstrations, both of which they loved. One student cheered “You guys are the most awesome people! You do all the cool stuff!” and another proclaimed “I love chemistry!” I am particularly fond of the second comment, because the girl and many of her peers were taking a genuine interest in chemistry. 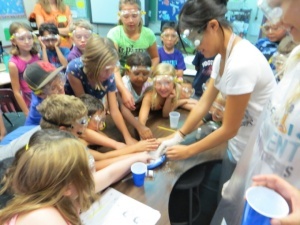 When we asked “Do you guys want to know how slime works?” the class shouted their approval. The participation was amazing. Whenever we asked a question, nearly everyone raised his or her hand with a grin and enthusiastic expressions. Even as their eagerness peaked, they remained respectful and followed our directions. We kept things interesting, and they did not dare turn away from us because they truly wanted to do more, and know more about what they were doing. Even beyond that, they wanted us to come back because they wanted to know even more about chemistry and what we could do with it. My favorite part of this activity was working with the students and being able to see their reactions. One student even asked me an in-depth question about the workings of chemistry, which was very exciting to see in someone so young. I loved being able to see how enthusiastic these young students were about learning about chemistry. During the cleanup, one of the boys walked up to me and asked “Are you going to be here every day?” I was caught off guard and had to ask “Do you mean for the rest of the year?” He nodded eagerly and I, myself, was disappointed to tell him we weren’t. After he sat at his desk a girl came up to me and said “I hope you come back next year! This is really fun.” I couldn’t help but grin and assured her that we’d be back. I have discovered that third-graders can be surprising in what they do and do not know, so presenters should be prepared for both insights and unexpected questions. I’ve had a great time and could see the enjoyment in the kids. I hope that one day, they follow with the foundations we laid for them and join the ChemClub themselves! 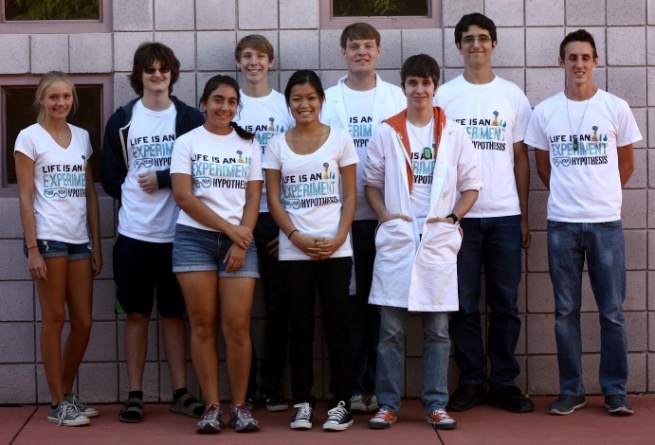 ChemClub members at Tanque Verde High School (TVHS) in Tucson, AZ, recently participated in the 2014 Tucson Earth Day Festival. 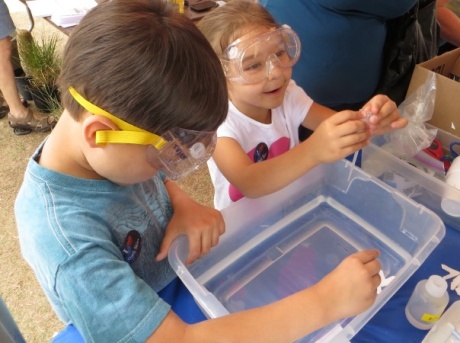 The festival is an annual event full of opportunities to showcase local science and environmental programs. 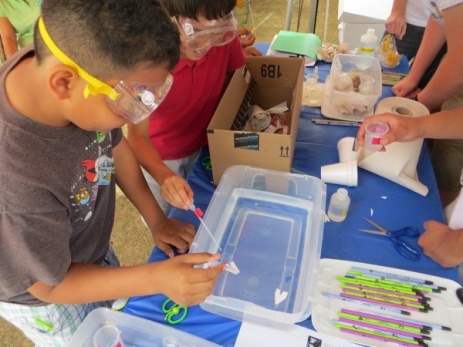 We joined forces with our Southern Arizona ACS Local Section to prepare hands-on activities and displays for the public to highlight Chemists Celebrate Earth Day (CCED). 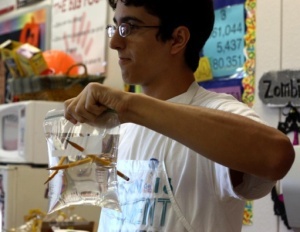 TVHS students brought several demonstrations related to the current CCED theme, “Wonders of Water,” to share. Groups of TVHS students rotated through the day to teach visitors about different properties of water. Our hands-on activities explored the cohesive and adhesive properties of water, changes in surface tension, and conductivity of water. We also collaborated to prepare a water filtration demo to display at the ACS booth. The greatest challenge for this outreach activity was the outdoor location—since the festival takes place in the park, we needed to battle the elements—sun and wind! For many of our visitors it was a chance to become a scientist for a day, wear goggles, use pipets and a conductivity meter, perhaps for the first time ever! Adding “fuel” = rubbing alcohol solution. Try it yourself! 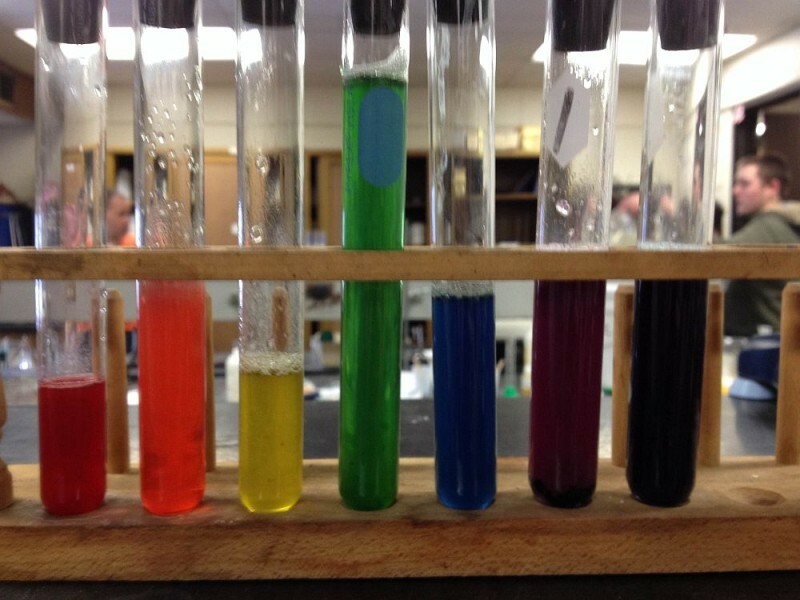 Chemistry, What Does It Matter? 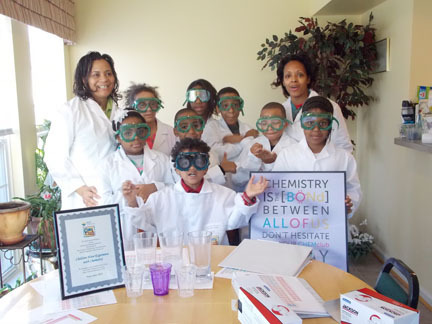 The Children Have Experience with Chemistry (CHEC) ChemClub met for the third time on January 18 since its charter in September 2013. The group is made up of seven- to eleven-year-old students from six public and private schools located in Prince George’s and Charles Counties in Maryland. The name describes the focus of the club, for children to have experience with chemistry. 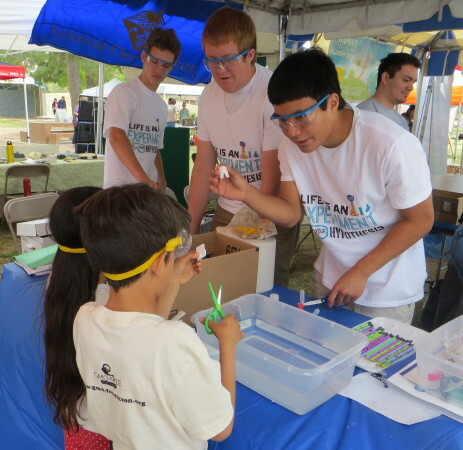 The group was started by two parents who wanted a local STEM-type (science, technology, engineering, and mathematics) club for their children. The club has expanded as students invite friends and additional parents get involved. The group meets on the third or fourth Saturday of the month in Upper Marlboro, Maryland. The first meeting topic was “Chemistry, What Does It Matter?” The student scientists ended the meeting by saying, “It Matters Everything Because Chemistry Is Matter.” During this meeting they also acted out the states of matter. The second meeting topic was “Exploring the Scientific Method.” If you imagine the curve on a question mark being a road, getting an answer or final statement is the period under the question mark. January’s meeting topic was an introduction to the periodic table. We look forward to the years ahead with this group. We are interested in field trips to other ChemClub meetings and presentations from other area groups. I’m a recent convert to Pinterest. It allows you to create your own virtual bulletin boards and fill them by “pinning” images that then link back to the websites you wish to remember. It’s a way to collect web content you like, with the visual pop of the images to help you remember what you pinned. I’m slowly populating my boards with pins, but often I’m more interested in using the site to see what other people have pinned. In particular, I’m curious to see the pins that connect to chemistry. 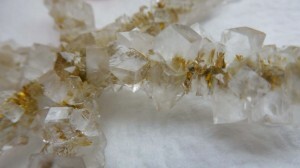 Something that’s cropped up lately with the holidays fast approaching are pins to borax crystal ornaments. What’s the chemistry? You make a supersaturated solution with boiling water and borax powder, then suspend a shape you’ve twisted out of pipe cleaners in the solution. The bristles of the pipe cleaners offer lots of places for the borax to crystallize as the solution cools and can no longer hold as much of the borax in solution. Cut a 12-inch pipe cleaner into three equal pieces. Use one piece as the center. Twist a second piece around the first to form the “arms” of the snowflake. Repeat with a third piece, for six symmetrical arms. Tie a string to the tip of one of the arms. Take a wide-mouthed glass jar or beaker. 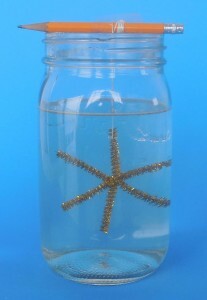 Suspend the snowflake in the chosen container so it does not touch the bottom of the container by tying or taping the other end of the string to a pencil that rests across the mouth of the container. Temporarily remove the pencil and snowflake from the container. Prepare a supersaturated borax solution—Boil tap water, then measure it by cups into the container. For each cup of water in the container, add 3 tablespoons of borax powder. Stir well. 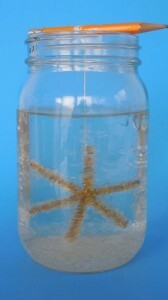 Borax powder may remain at the bottom of the container. Place the snowflake in the container again, with the pencil resting across the top of the container. Placing the snowflake into the supersaturated borax solution. After sitting overnight, a beautiful collection of crystals. A quick search on Pinterest showed a huge variety of shapes to try—borax crystal rainbows made with colored pipe cleaners, monograms, beautifully-elaborate snowflake designs, hearts, the American flag, candy canes, shamrocks, a Halloween spider, an Easter egg, stars, icicles, and even crystallizing the borax onto feathers. I love the idea of adapting it to fit other holidays and uses. Looking for other holiday chemistry resources? Visit the latest ACS ChemClub Activity of the Month “Holiday Chemistry” or follow ACS ChemClubs on Pinterest! Do you integrate holidays into your Club and classroom? What are some of your favorite resources?